In the spirit of offering another high-quality and affordable Old-Timey banjo, we present the “Tupelo”. 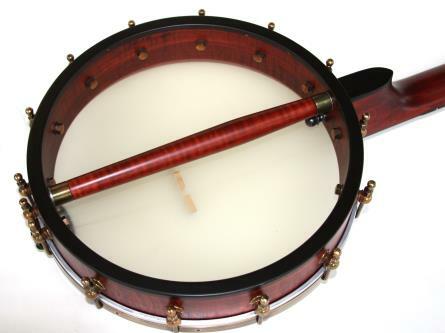 Like the new “Minstrel” model, this banjo has a 12″ tone-rim (wood tone ring) fitted with 14 brackets and a single wooden rod in the pot; a slightly shorter and fuller neck with a scale of 25.5″ and nut width of 1.34″; and aged brass including our new tailpiece, the “Sweetone”. The banjo pictured here is a custom model featuring an Ebony Fretboard, and Curly Maple Neck & Rim with a Satin Finish! Weighing only 5 pounds, the “Tupelo” makes an earthy, round tone with nice volume, and has wonderful bounce in playability. Any player seeking to blend into an Old-Time jam will be very satisfied with the articulate yet sweet sound of this banjo.